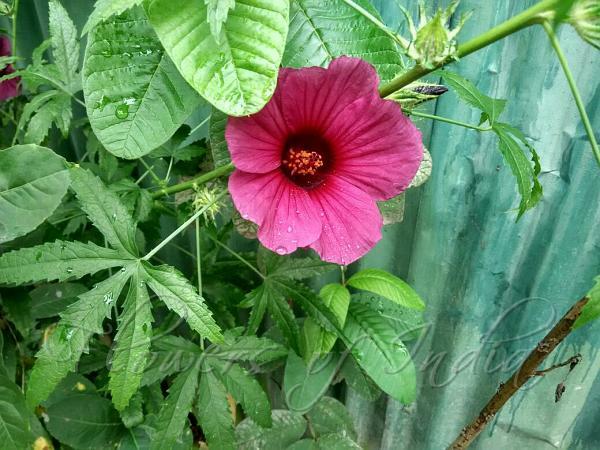 Kenaf is a species of Hibiscus, probably native to southern Asia, though its exact natural origin is unknown. 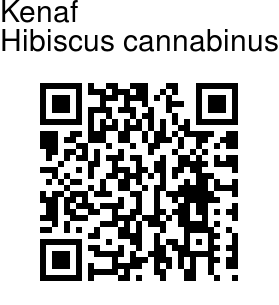 The name also applies to the fibre obtained from this plant. Kenaf is one of the allied fibres of jute and shows similar characteristics. It is an annual or biennial herbaceous plant (rarely a short-lived perennial) growing to 1.5-3.5 m tall with a woody base. The stems are 1-2 cm diameter, often but not always branched. The leaves are 10-15 cm long, variable in shape, with leaves near the base of the stems being deeply lobed with 3-7 lobes, while leaves near the top of the stem are shallowly lobed or unlobed lanceshaped. The flowers are 8-15 cm diameter, white, yellow, or purple; when white or yellow, the centre is still dark purple. The fruit is a capsule 2 cm diameter, containing several seeds. The leaves are cooked and eaten in Manipur, and are called sougri.